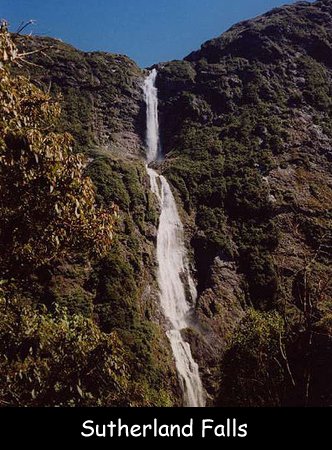 Sutherland Falls is one of the highest waterfalls in the world. This waterfall has a total drop of 1,904 feet in leaps of 815 feet, 751 feet, and 338 feet. The falls are located within the Fiordland National Park in New Zealand. It is fed by a small circular lake called Lake Quill which is a rock basin that directly falls over the vertical cliff. Lake Quill occupies a small rock basin that was formed by ice-action during the Ice Age. New Zealand is a country with a lot of major waterfalls. Sutherland Falls has a tiered plunge because the water makes three different leaps on its decent. The waterfall eventually empties into the River Arthur. In order to visit these falls, visitors need to hike along the Milford Track which is one of the most exciting walking trails in the country. It is a challenging trek so you must be well equipped with appropriate clothing, gear and footwear. Sutherland Falls are named after Donald Sutherland, a prospector, who became the first European to see them in 1880. He explored much of the surrounding country in search of a new route to Lake Wakatipu. Being more specific, these falls are located in the remote south island of New Zealand. Lake Quill, which is the source of these falls, was named for the explorer who first climbed up the cliff face to find it in 1890. Declan, Tobin. " Fun Facts for Kids about Sutherland Falls ." Easy Science for Kids, Apr 2019. Web. 26 Apr 2019. < https://easyscienceforkids.com/sutherland-falls/ >.